Bonnie Mechefske runs a small home based business in Ottawa making natural personal care products called Mains de Mariposa. 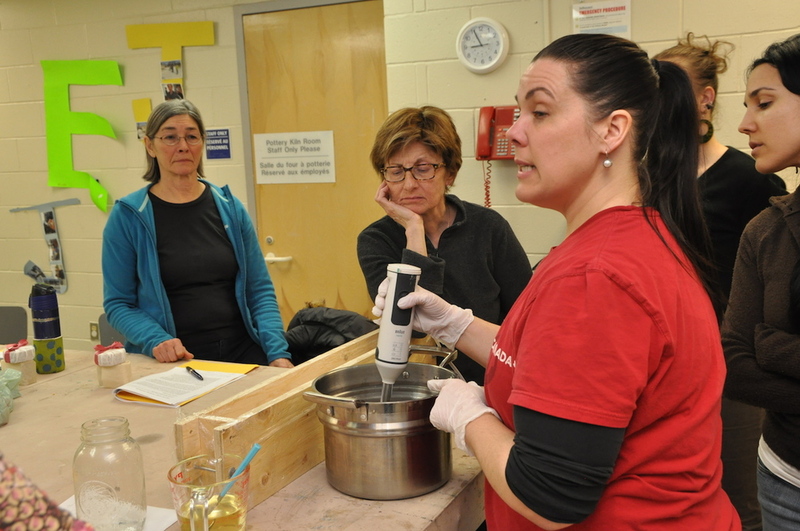 She showed the class the techniques of making cold-processed soap with common ingredients and equipment. 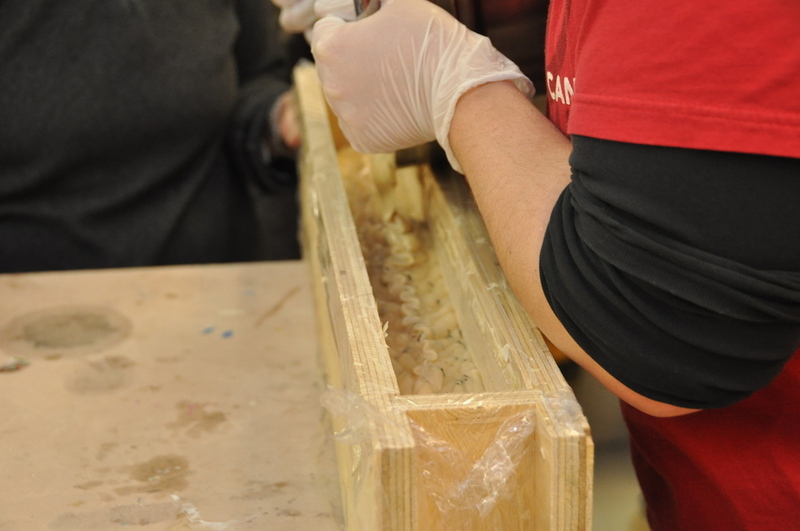 Everyone had a chance to cut a bar of soap from an un-moulded block. Ryan and his team from Tranquil Acres Therapeutic Equestrian Centre visited Dovercourt on Fri. Nov. 29 to give a presentation about equine therapy, which included a slide presentation, a video, questions from the audience and an opportunity for a hands on meeting with Rayne, a miniature horse and Cecil, a 6 month old miniature donkey. This year's event was attended by principals and vice principals from the 23 schools in Dovercourt’s area, as well as local politicians, local religious leaders, other community leaders, staff from community service organizations, local service clubs, our sponsors (Scotiabank and the Morris Home Team) and Dovercourt Board members and staff. The discussion forum focused on how the community must find a way to keep learning and caring going beyond the school years for people with special needs. Speakers included Amanda Telford, the mother of a 19-year old son who is diagnosed with Autism Spectrum Disorder (ASD), Anne Villeneuve, a teacher at Ottawa Technical Secondary School who teaches youth diagnosed with autism spectrum disorder, Holly Martin, the Dovercourt employee who serves as the coordinator for WAVE Ottawa and Steven Woods, a WAVE apprentice who joined the WAVE Prep Program in September 2013 and became a paid maintenance employee at Dovercourt in October. In our own small way, Dovercourt has a number of initiatives to do just that, and has recently started a new initiative called WAVE, with the mission “To raise awareness and realize the potential of adults with autism in the workplace”. WAVE (Work and Volunteer Experience) is funded by Unity for Autism, and endeavours to find work and volunteer placements for adults with autism in the Ottawa area, and support them with the help of job coaches. Abby Al-Azzawi presented part 1 of Introduction to Raw Food Cooking on Nov. 18, making easy & delicious treats as banana chocolate smoothies (bananas, hemp milk, raw cacao and almond butter), protein balls (dates, almond butter, raw cacao, coconut oil, garnished with coconut or chocolate sprinkles or pieces), cashew butter stuffed dates, and apples with cashew butter. Billy Russell instructed the group on how to make a fire using the bow drilling technique. Materials used included a wooden plank, a knife, nylon rope, a branch/ twig and kindling like birch bark. The sound of high pitched squeaking could be heard, as participants furiously sawed their bows, turning their 'drills' to create flammable 'coal'. Billy made it look easy, producing smoke within a few seconds of sawing. Like any skill, it takes practice, he said. CBC Morning was there to record the session and interview attendees.